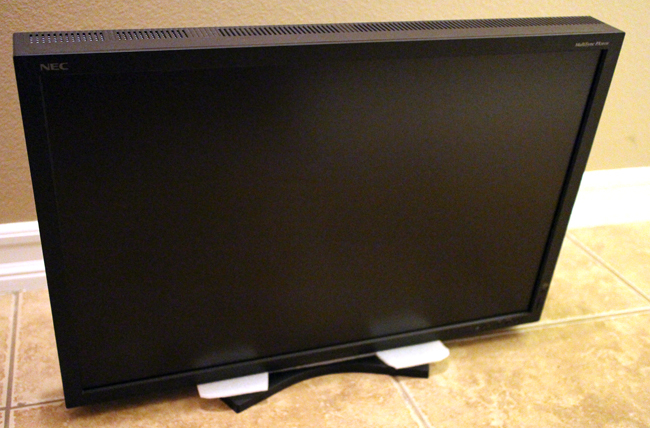 My first impressions of the PA301W monitor come from its size. It isn’t a small monitor -- and I don’t just mean the screen size. Compared to the Apple 30” monitor that was discontinued a while back, this thing is definitely twice as thick. And it’s heavier, too. But there are reasons for this. In any case, two handles toward the top of the back of the screen aid in lifting and moving the monitor onto your desk/workstation. 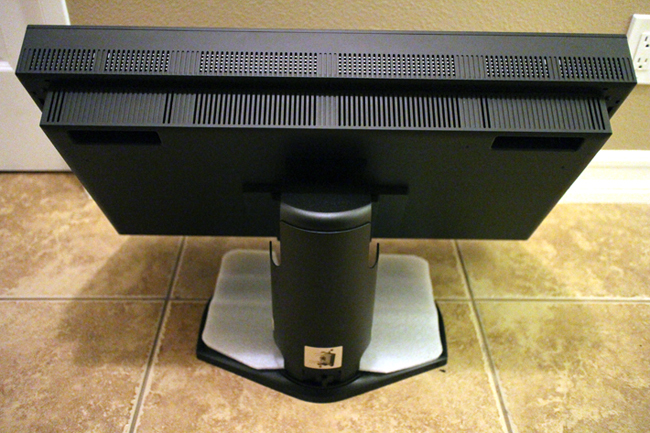 The stand lets you angle the monitor up or down or side to side, slightly, so you’re not completely stuck with the position of the monitor (it can be off to the side a bit). One of the nicest things that I have to say about this monitor is that it comes with all of the necessary cables you might ever need to run it. The monitor features both DVI and mini display port (that you’d plug into the same port as your Thunderbolt port on a newer computer) through the cables it comes with. So you won’t need to go out and buy any silly adapters before your get to use this baby once it’s out of the box. First and foremost, one big difference between this monitor and the others is the hardware. Now, there's a good chance this isn't something you've taken into consideration when buying a monitor. In fact, there's a good change you haven't even thought about this at all...but that will change, because it's important. You can use a calibration hardware and software combination to calibrate any monitor (more on the specifics of that later), but most monitors such as those $300 30” Dell monitors, and even the Apple one, will apply those calibration parameters before sending the signal out to the monitor. 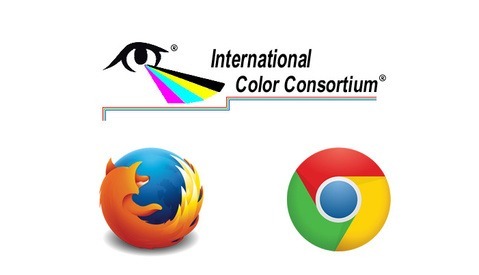 That makes sense because the graphics card in your computer has to compensate for each color so it can tell the monitor what colors to actually show. However, the NEC monitor has hardware within the monitor itself to do this conversion. This is huge, as it frees up your graphics card from having to do the conversion itself. 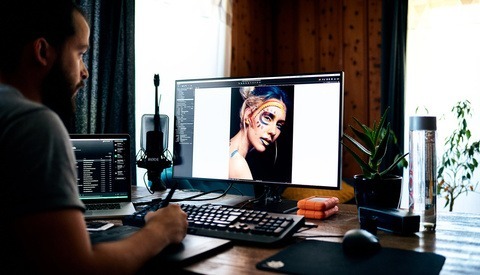 While this might normally only be a big deal for those who work with video, editing applications such as Photoshop are finding ways to make more and more use of that graphics card in your computer, especially as the quality and speed of those cards increases in newer systems. So if you’re wondering why a monitor needs to be this big, this is why. And it’s well worth it. Besides, you probably won’t be moving this thing between desks on a daily basis anyway. But what you’re really buying this monitor for is the color accuracy, right? Now, I can’t honestly tell you I looked at this monitor and realized, “Wow, that’s more accurate.” The human eye can’t tell the difference that well, and though I’d like to think of myself as super human, my eyes are no different than yours. So, naturally, I had to do some tests. Honestly, part of me thought, what could be so great about having a color-accurate, color-corrected monitor? I already have the Apple monitor and calibrated that a while back. Could this be better? Indeed, it was. Even with my Apple monitor, I still print several proofs before finally finding something that prints somewhat as I had envisioned, but still not quite perfectly. The NEC display was another story. I could edit the file that I needed to print, send it to my six-year-old Epson R1800, and never worry about a proof (of course, make sure you have the ICC profiles downloaded and installed from your printer and/or paper manufacturers’ websites). If I didn’t like what came out, it was always because I just wanted to tweak things a bit as my taste changed. Now, this didn’t happen out of the box, but a short calibration process with NEC’s SpectraViewII is all that was needed. I let the monitor warm up for 45 minutes (you really only need 30, as recommended), ran the software (which finished in less time than it estimated it would take), and voila! The most time-consuming aspect of this was taking the monitor out of the box and putting it on my desk. However great this is, though, is it worth it? $2000+ is still a lot of money to spend on a monitor. Indeed, though, if you’re color correcting video, there’s no doubt this is for you. The size of the display will give you ample workspace, and you’re going to want the hardware in the back of that monitor to free up your own computer’s GPU (attention, all you RED footage editors that insist on using your new Macbook Pros on set). Additionally, if you’re printing often, at home or with your lab, I can’t express enough how time-consuming it is to have to reprint five versions until you finally get the right one. This takes the guesswork out of printing and will save you that much time, too. And the best part, you really only do need to calibrate the monitor and have the right ICC profile. That’s it! Forget about printer calibrations...your manufacturers have already done that for you with those ICC profiles. However, if I were working mostly on web content, I can’t say I would give a thumbs up. That’s simply because, odds are, you’re working in sRGB and certain web colors within that and have all the alpha-numerical hex values for your client’s red logo and blue font. So regardless of what you’re seeing on the screen, it’ll be as good as it gets for online viewing -- everyone’s monitors are different. Now, if you’ve already made the decision to upgrade and are now comparing this NEC monitor to other high-end monitors out there, there are a few things to consider. This one has 10-bit color. If you look at the color sRGB and ProPhotoRGB color space models, it’s amazing what you’re not missing. 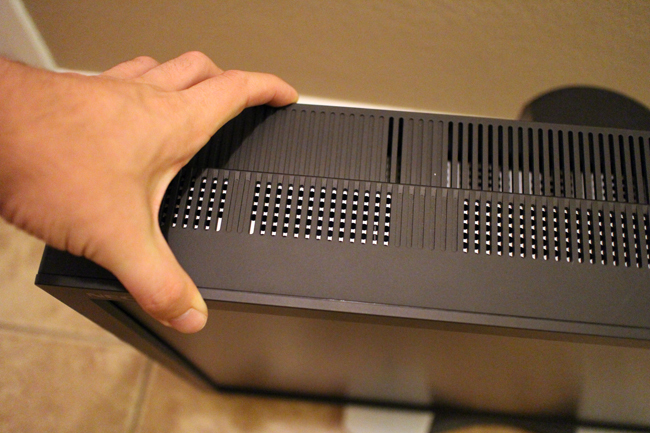 You also have all kinds of data connections on the back, including other USB 2.0 ports and HDMI ports for connecting another computer (that's right, you can share this monitor and the peripherals attached to it between your desktop and laptop when you're at the office). The software used to control the monitor’s functions includes a 14-bit lookup table and will let you set your own white balance and model colorspaces in 3D. So if you’re that much of a color junkie, you can do ANYTHING, really. It’s way beyond what I’d ever need, but whatever situation you might find yourself in the future, you’ll be ready. Right now, for my current work, I don’t print that much. I’m still a student and will have a major senior show coming up -- one that would be great to have this monitor for -- but other than that, I won’t need it enough to drop a couple grand on it. That said, as soon as I graduate and get a steady job, I’ll be getting this monitor. The size is perfect for displaying those huge D800 files, and what’s the point in doing color fine art work if you can’t get the proper color from your printer because you can’t see what the printer sees? It’s that simple. There’s no substitute for a great monitor. NEC gives a four-year warranty based on running your monitor 24/7 for four years. But assuming you won't be using it nearly that much, you could easily have longer than a decade of color-accurate performance from your NEC monitor. 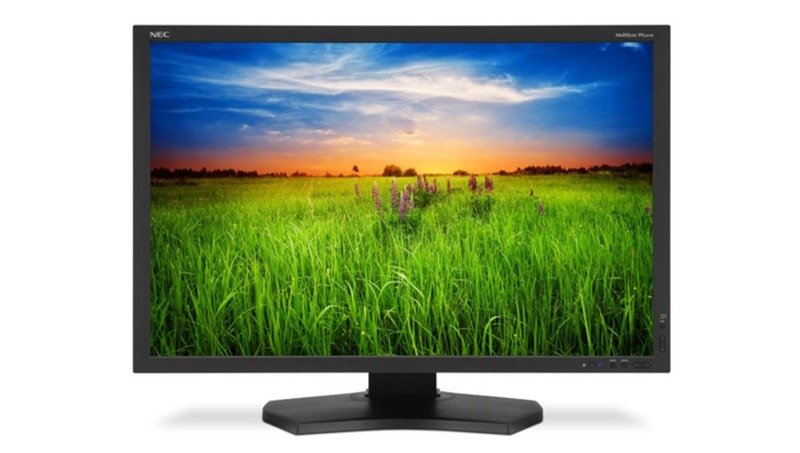 If you're interested, you can order the PA301W monitor here from B&H for just under $2400. At the time of this posting, they even have a used one for $1700, though, so you might want to jump on that. Fstoppers Reviews the ViewSonic VP2768 - Best Monitor Under $500? Just out of curiosity, what display type is it? Have you ever retouched for 7 hours on a 30" monitor? Not sure why size matters...does it improve the end image? Not at all. I was stating that its more strainful on the eyes to be retouching on a 30" monitor for 7 hours than it is on a 24". Even going down to a 27" takes a lot of the strain away. Whether you're sitting in front of a 24" or a 30" monitor you will likely sit and stare at the monitor from the same distance, right? Watching your 50" tv from 9feet is ok, but how comfortable is it when you move in 6 feet? People should get whatever they prefer, but I would urge you to try and work on a 30" monitor before you get one. Its not for everyone. Like you said Jon, you need distance to be able to appreciate the size. From experience, I find that a 24", from an arm's length, is perfect for day long usages. actually this monitor only has usb 2 ports, not usb 3. There is a third, somewhat neglected player in the pro display market - HP. I am extremely happy with the 24" HP Dreamcolor display (developed together with Lucas' Dreamworks studios, has all the bells and whistles of the Eizo CG series and then some), paired to a Dreamcolor mobile workstation (the only laptop with integrated professional-grade display) and an HP calibrating tool (a customized i1). Getting correct color on both displays is extremely fast and simple. For the life of me I cannot understand why more photographers aren't using these and instead opt for the sub-standart Apple stuff that costs twice as much and delivers half. HP should really push the marketing for the Dreamcolor series of displays and laptops, people simply do not know they exist. I CAN'T believe anyone has mentioned Dell's brilliant u2711 so far. 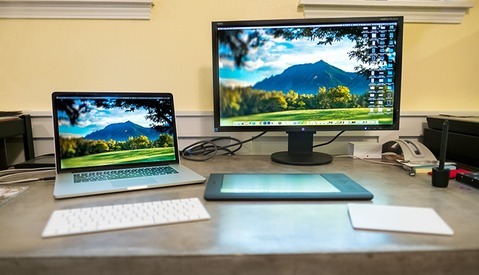 I have one and it's impressive, way better than those cinema displays the author mentions in the article, which seems to contemplate just two options as 'serious': apple displays and ultra-expensive monitors. Dell's u2711 color reproduction is really good too. I usually go to TFT Central for thorough monitor reviews. They don't have the 30" in stock, but the 27" comes close I believe. I own the PA241W and I love my NEC monitor. The only problem is I wish I had bought the 27 inch one. I do work close to my monitor and I personally think 30 inches would be to big. 27 inches would be perfect. I looked at many monitors before buying. The last thing I wanted was a shinny monitor. I needed a matte screen because I have a big window behind me in my office. I read many reviews and for the price NEC was the best choice. I picked a profile that worked both for internet and Photoshop. My images are a perfect color match when I print on my Epson 3880 printer when I use the Epson Pro Luster paper. Make sure you get the Spectravision software that comes with the monitor puck. It is very easy to calibrate NEC monitors. If you have any questions in the beginning NEC has a very good tech support department that will walk you through it.